What does ‘Evidence-Based practice readiness’ really mean and what predicts it? The problem of knowledge hiding in organisations: what causes it? There has been a considerable rise in interest around developing evidence-based practice in organisations in recent years. Peer-reviewed research volumes around the topic of evidence-based practice have risen from 571,000 studies in 1970 to over 4,371,000 last year. As more and more organisations become interested in using evidence-based practice across many of their functions and operations, there has been an increasing interest in what has been termed evidence-based practice readiness. 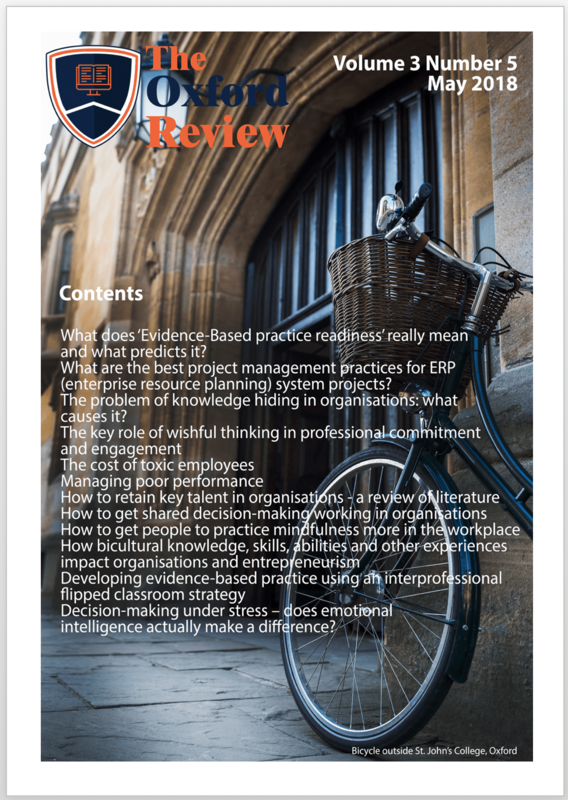 Whilst, at one level, the idea of evidence-based practice readiness appears to be simple: how equipped, organised and capable an organisation is to start using evidence-based practice, there is a bit more to it. For example, what are the key elements of evidence-based practice readiness and what other factors predict it? A new study looks at what evidence-based practice readiness really is and how to predict it in your organisation. This study is most useful for anyone engaged in getting evidence-based practice embedded in their organisation. Over the last 10 to 15 years there has been a veritable explosion in the development of ERP or enterprise resource planning systems. Enterprise resource planning systems refers to IT-based systems that are built around a centralised database, integrated and have a common computing platform in order to help an organisation use its resources effectively and facilitate a coherent flow of information between all business functions of the organisation and its external stakeholders. In this context, the term enterprise refers to any organisation that has a common set of goals across it. It is recognised these days that the development of an effective enterprise resource planning system is central to the existence of any decent sized organisation. Further, that the success of project management systems and processes in larger organisations depend on effective enterprise resource planning systems. This research briefing summarises a study that looked at the best project management approaches to implementing ERP systems. One of the key facets of a learning organisation is knowledge sharing. All knowledge management systems and processes are based on knowledge sharing and having employees and managers withhold or hide knowledge seriously debilitates organisational learning and performance. Knowledge hiding refers to deliberate and intentional attempts to withhold or conceal knowledge from co-workers and managers, either who need it in the normal operations of their jobs or who have requested it. Recent studies (2012, 2014, 2015) have found that deliberate knowledge hiding has a range of serious consequences for organisations. This review looks at a study that focusses on finding the causes of knowledge hiding in organisations. An essential piece of research if you are going to identify it stamp it out. In recent years, one of the primary constructs in the employee and organisational engagement research literature has been the idea of organisational citizenship behaviours. Organisational citizenship behaviours, or those actions and activities that go beyond those required within the scope of an individual’s job description, have been found to be reliable predictors of a range of outcomes, including employee performance, organisational performance, employee engagement, reduction turnover intention and a range of other positive outcomes. Part of these strong connections between organisational citizenship behaviours and performance -related behaviours is the role of motivation. High levels of commitment increase an individual’s motivation, and high levels of motivation tend to increase an individual’s commitment. One of the side-effects of this virtuous spiral is an increase in optimism. Conversely, it has been found that there is a strong connection between individuals with low levels of commitment and motivation and an overall pessimism or expectation of negative outcomes from their engagement with the organisation. Therefore, a number of recent studies (2016 and 2017) focused on the role of optimism, pessimism and state of mind. Indeed, studies in 2016 found that high levels of wishful thinking tend to result in higher commitment levels. Interpersonal deviance, which includes behaviours such as bullying, sexual harassment, mistreatment of others, undermining people, verbal and physical abuse, as well as both overt and covert aggression such as passive aggressive behaviours. Interpersonal workplace deviance has a range of negative effects, both for the targets of the practice and the organisation, particularly in terms of performance and turnover. A new study (2018) looking at the cost of workplace deviance has just been published. Lower levels of employee turnover. A new study by a team of researchers from Murdoch University and a Melbourne hospital wanted to understand the perceptions and experiences of managers having to manage poor performance to see what can be learnt. A key role of management at all levels of an organisation is to provide an environment whereby talented staff stays within the organisation, rather than looking for more attractive opportunities elsewhere. Churn, or turnover of key talented staff, is considered to be a primary risk to any organisation. It is, therefore, imperative that organisations understand how to retain talented employees and keep them engaged. Many previous studies have looked at this problem and come up with a range of recommendations for retaining key members of staff. A new (2018) literary review analysing these previous studies has just been published and makes seven core recommendations for organisations. One of the often-overlooked tenets of evidence-based practice is the idea of shared decision-making. Shared decision-making refers to the process of determining a strategy or tactic, in order to deal with an issue or solve a problem by multiple stakeholders within the decision-making parameters. In healthcare, for instance, shared decision-making means that both the medical staff and the patient are involved in making the decisions. In commercial and service organisations shared decision-making refers to a process whereby the customer or client or other stakeholder is involved in the decision-making process. Now, clearly, only certain types of decisions are suitable for shared decision-making. However, previous studies found that there are a range of positive benefits to including the end user in certain decision-making processes. Not only do end-users, such as patients or customers, feel included, but it has been found that organisations tend to make better customer focused decisions when the customers are involved. A number of studies (1997, 2007, 2013) found that not only does shared decision-making provide better solutions for the client or customer, but that a series of cost-benefit analyses have found that shared decisions are frequently less costly than organisational or systems derived decisions. what organisational-level characteristics influence the implementation of shared decision-making. what strategies help in the implementation of shared decision-making. As can be imagined, this study is somewhat complex and involved. Our review simplifies and makes the study accessible for you. There is ample evidence for the positive benefits of mindfulness and as a result many organisations promote the practice with the workers. However, a wave of recent research has found that whilst people are good at engaging in mindfulness during formal interventions, such as classes et cetera, their engagement with it often tends to be patchy and sporadic in workplace contexts. A number of studies found that mindfulness is best practised on a continual basis in order to get the best results. A new study by a team of researchers wanted to find out what it is that prevents people from practising mindfulness on a more frequent and continual basis. This is a very useful study for anyone interested in mindfulness, work-life balance and improving mental health. A diversity of cognitive ability. A set of bicultural competences and skills not found in monocultural individuals. A wider range of stakeholder management and relationship building capabilities. A different way of looking at opportunity recognition. Higher levels of flexibility and adaptability. The ability to be able to engage in what is known as language-activated frame swapping, which refers to the ability to move rapidly from one cultural set of mental frames to another that is not apparent in bilingual individuals. The ability to engage with and analyse other cultural perspectives. The ability to understand a wider range of customer perspectives. As can be seen from the above, research has shown that there is a significant difference between a bilingual individual and a bicultural individual. Whilst bilingual individuals are able to communicate in two or more languages, actually understanding and appreciating the thinking, meaning and cultural artefacts from other perspectives is a different skill set. This review looks at a study which has researched the impact bicultural people have in organisations and how best to utilise their attributes. Whilst evidence-based practice is standard in some industries such as health and air transport, it is still a fledgling practice in many other sectors and organisations. However, there is a growing understanding of the advantages that evidence-based practice can bring to an organisation. As a result, there is increasing interest in developing evidence-based practice. One of the issues that organisations face is how to develop the thinking, attitudes, knowledge and skills of staff, in order to move towards more evidence-based practices. A new study by a team of researchers looked at and evaluated a new approach using an interprofessional flipped classroom educational strategy. This is a very useful study for anyone in organisational learning / learning and development, or anyone involved in developing evidence-based practice. There has been a veritable explosion of research and interest in emotional intelligence as a concept since the early 1990s. The researchers wanted to know how emotional intelligence impacts decision-making under stress. Download this copy of The Oxford Review and be the most up-to-date and well-informed professional around.